Sean McFate is a professor of strategy at the National Defense University and Georgetown University’s School of Foreign Service in Washington, DC. While his academic credentials are impressive, so is his military experience. Dr. McFate served in the US Army and with a private defense contractor that provided private armies for hire. I reviewed McFate’s earlier book on warfare The Modern Mercenary: Private Armies and What They Mean for World Order in 2015. McFate did an excellent job describing the significance of the US policy decision to finance significant private mercenary capacity and what history tells us about the potential impact. 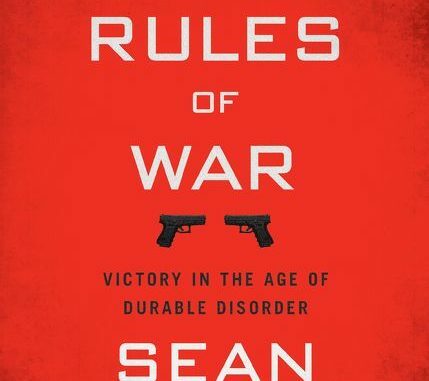 Dr. McFate’s new book The New Rules of War – Victory in the Age of Durable Disorder addresses one of the significant truths of America at war – we keep losing. We lost in Viet Nam. We lost in Afghanistan. We lost in Iraq. We are losing in Syria. And the more we lose, the more money we keep spending and the more expensive equipment and technology we buy. McFate describes new rules of war in a multipolar world with private armies for sale and a rising China and a stronger Russia. He suggests practical options for what we should do to succeed at war in this environment. Despite McFate’s significant experience, his analysis depends on naivite about the real nature of America’s secret societies, finances, covert operations, funding and goals. He has bought too much of the official story and as a consequence has bought into the incompetence cover story – for both the coup d’etat in 1963, the financial coup d’etat that started in the mid-1990s and the real goals of our wars and our war machine. In part, his analysis underscores one of the serious costs of secrecy – our world is full of talented men and women who keep misdiagnosing problems and solutions because the intelligence they need to make a meaningful contribution is secret. Despite this, McFate’s analysis is well worth reading. The squeeze in the debt markets means that we may not be able to continue to throw money at the war machine. We might need to field an economic military. In my interview with Professor Mair on Sun Tzu’s The Art of War, I said that the difference between Chinese military strategy as reflected in Sun Tzu’s The Art of War and Western military strategy as reflected in Von Clausewitz was the bond market. If the day should come when the West has to finance war on a pay as you go system, expect big change. McFate’s analysis will be welcome. “Warfare is a great affair of state. The field of life and death. The way of preservation and extinction. The future of the dollar depends almost entirely on the US military. If you want to understand the future of the currency and bond markets, then you need to understand both the present and the future of war. Consequently, you will find both of Dr. McFate’s books on our Best Books for 2019 Reading List.